These capris come in several sizes and designs. These are great for yoga, pilates, running, exercise, or just doing errands. My daughter likes how these fit. She can toss them in the washer, dry them, and they are ready to wear again. 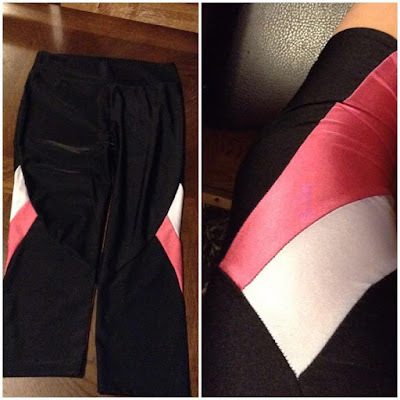 She loves pink so the pink and white inlays are a great color contrast for your legs. These capris move well for her active lifestyle and keep up with her. She gives them a thumbs up and hopes there will be more colors to choose from soon. These capri's can be found in several colors on Amazon. What Blink Creation has to say about their product. Perfect Fit, Spandex and polyester mix material for ideal stretch and softness. Practical - Perfect as weekend lounge wear or layering under skirts or dresses. Top Mobility - Ideal for jogging, yoga, and gym time. Disclosure: MarksvilleandMe received one or more of the products mentioned above as part of a promotion with Tomoson and Blink Creation. Regardless, MarksvilleandMe only recommends products or services we use personally and believe will be good for our readers. Some of the links in the article may be “affiliate links.” This means if you click on the link and purchase the item, I will receive compensation. If you would like MarksvilleandMe to review a product or service please contact us at marksvilleandme@gmail.com.